(a) Clean the contact surfaces of the rear differential case sub-assembly and differential ring gear. 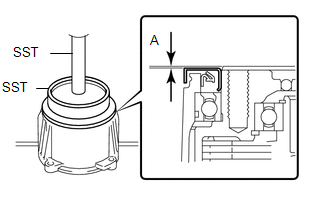 (b) Heat the differential ring gear in boiling water. 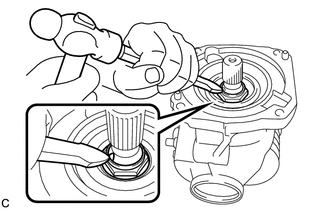 (c) Carefully remove the differential ring gear from the boiling water. (d) Secure the rear differential case sub-assembly between aluminum plates in a vise. (e) After the moisture on the differential ring gear has completely evaporated, quickly install the differential ring gear to the rear differential case sub-assembly. (f) Align the matchmarks on the rear differential case sub-assembly and differential ring gear, and install the differential ring gear. (g) Temporarily install 12 new rear differential case bolts to which thread lock has been applied. Toyota Genuine Adhesive 1360K, Three Bond 1360K or equivalent. (h) After the ring gear has cooled sufficiently, tighten the 12 new rear differential case bolts. New rear differential case bolts should be used every time the differential ring gear is installed. Install the new rear differential case bolts by tightening diametrically opposite bolts uniformly in several passes. Tighten the rear differential case bolts after the differential ring gear has cooled down sufficiently. Do not allow any oil to contact the rear differential case bolt, differential ring gear threads or rear differential case sub-assembly seating surface. (a) Using SST and a press, install a new rear differential case bearing (LH side inner race) to the rear differential case sub-assembly. Replace the inner and outer races as a set. (a) Using SST and a press, install the rear differential case bearing (RH side inner race) to the rear differential case sub-assembly. 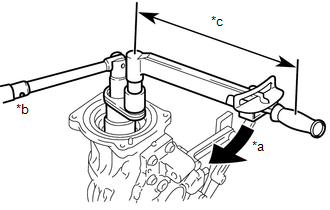 (a) Using a plastic hammer, install the 4 straight pins to the rear differential carrier. (a) Using SST, bolt, nuts and washers, install the rear drive pinion rear tapered roller bearing (outer race) to the rear differential carrier. Use M12 x P1.5 bolts with shaft lengths of 124 mm (4.88 in.) and M12 x P1.5 nuts for installation. (a) Using SST and a press, install the rear drive pinion front tapered roller bearing (outer race) to the rear differential carrier. (a) Install the rear differential drive pinion plate washer to the differential drive pinion. Install each rear differential drive pinion plate washer to the position it was removed from. 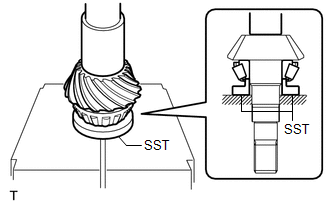 (b) Using SST and a press, install the rear drive pinion rear tapered roller bearing (inner race) to the differential drive pinion. 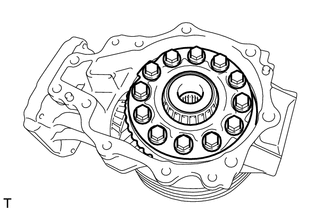 Replace the rear differential case bearing (LH side outer race) when removing the rear differential case bearing (LH side inner race) from the rear differential case sub-assembly. 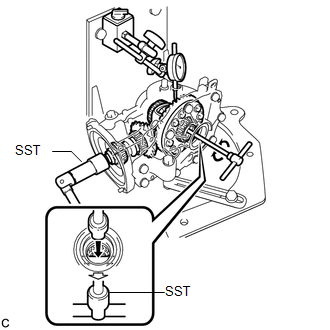 (a) Using SST and a press, install the rear differential side gear shaft plate washer and a new rear differential case bearing (LH side outer race) to the differential side bearing retainer. Install each rear differential side gear shaft plate washer to the position it was removed from. Install the rear differential side gear shaft oil seal after performing the tooth contact inspection and backlash adjustment. 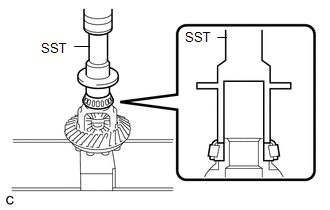 (a) Using SST and a press, install the rear differential side gear shaft plate washer and the rear differential case bearing (RH side outer race) to the rear differential carrier. (a) Install the differential drive pinion with rear drive pinion rear tapered roller bearing (inner race) to the rear differential carrier. 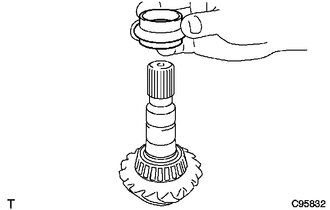 (b) Apply hypoid gear oil LSD to the threads of a new rear drive pinion nut and its seating surface. (c) Install the rear drive pinion front tapered roller bearing (inner race) and rear drive pinion nut to the differential drive pinion. 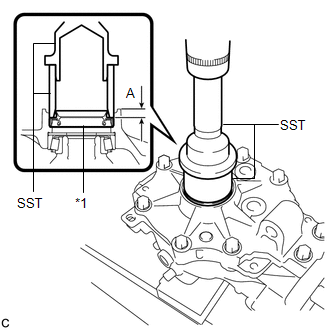 (d) Using SST, gradually tighten the rear drive pinion nut until the specified preload is reached. Do not exceed the torque limit shown below. Tighten the rear drive pinion nut gradually. Never tighten it excessively. 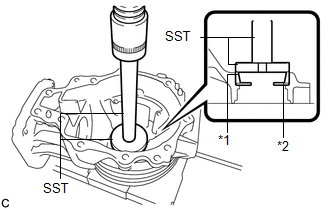 (e) Using SST and a torque wrench, measure the preload (starting torque) of the differential drive pinion. For a more accurate measurement, rotate the bearing forward and backward before inspection. (a) Using a scraper and wire brush, remove the seal packing from the rear differential carrier and differential side bearing retainer. Be sure to completely remove all seal packing from the rear differential carrier and differential side bearing retainer. 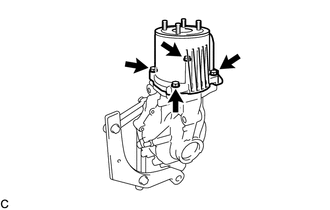 Do not allow the removed seal packing to enter the rear differential carrier. (b) Install the rear differential case assembly to the rear differential carrier. (c) Install the differential side bearing retainer to the rear differential carrier with the 10 bolts. (d) If the result is not within the specified range, select rear differential side gear shaft plate washers that are thicker or thinner as necessary. Adjust the thickness of the left and right rear differential side gear shaft plate washers in equal increments. Then install the rear differential case bearing (outer race). Adjust the thickness of the LH and RH rear differential side gear shaft plate washers by the same amount each time until the backlash is within the standard range. 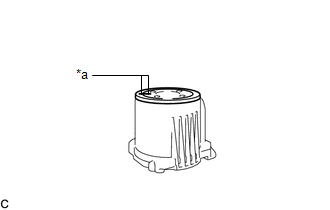 If the thickness on the LH side is increased, decrease the thickness on the RH side, and if the thickness on the LH side is decreased, increase the thickness on the RH side. When the backlash is smaller than the specified value, select a thick rear differential side gear shaft plate washer for the RH side and thin rear differential side gear shaft plate washer for the LH side. When the backlash is larger than the specified value, select a thin rear differential side gear shaft plate washer for the RH side and thick rear differential side gear shaft plate washer for the LH side. 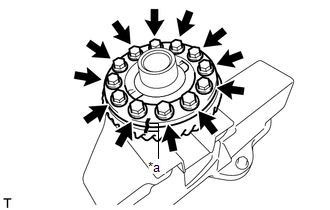 (a) Remove the 10 bolts and the differential side bearing retainer. (b) Remove the rear differential case assembly from the rear differential carrier. 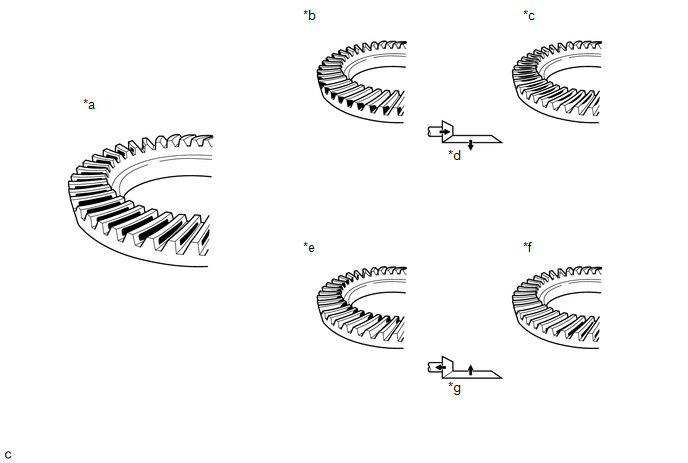 (c) Coat 3 or 4 teeth at 4 different positions on the differential ring gear with Prussian blue. (d) Install the rear differential case assembly to the rear differential carrier. 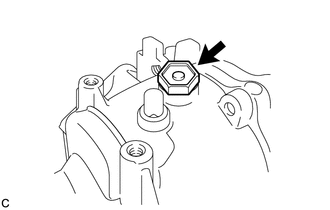 (e) Install the differential side bearing retainer with the 10 bolts. (f) Turn the differential drive pinion at least 10 times. (g) Remove the 10 bolts and the differential side bearing retainer. (h) Remove the rear differential case assembly from the rear differential carrier. (i) Inspect the tooth contact pattern. 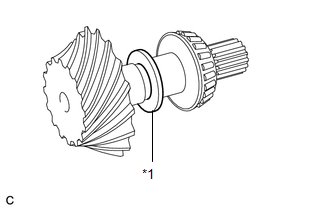 Check the tooth contact pattern at 2 or more positions on the circumference of the differential ring gear. (1) If the result is not within the specified range, select rear differential side gear shaft plate washers that are thicker or thinner as necessary. Adjust the thickness of the left and right rear differential side gear shaft plate washers in equal increments. Then install the rear differential case bearing (outer race). (2) Repeat the differential ring gear and differential drive pinion tooth contact pattern inspection. If the tooth contact pattern is not correct, reselect rear differential side gear shaft plate washers and reinspect the tooth contact pattern. (3) Repeat the differential ring gear and differential drive pinion backlash inspection. 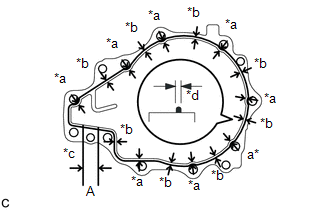 If the differential ring gear and differential drive pinion backlash are not as specified, reselect the rear differential drive pinion plate washer and then readjust the differential drive pinion preload, differential ring gear and differential drive pinion backlash and reinspect the tooth contact pattern. (1) Select a rear differential drive pinion plate washer again and install the rear drive pinion rear tapered roller bearing (inner race). (l) Readjust the differential drive pinion preload, differential ring gear and differential drive pinion backlash and reinspect the tooth contact pattern. 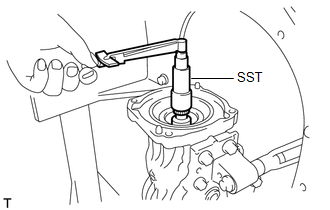 (a) Using SST and a torque wrench, measure the total preload (starting torque) with the teeth of the differential drive pinion and differential ring gear in contact. (1) Select a thicker or thinner rear differential side gear shaft plate washer for the RH side, and then install the rear differential case bearing outer race (RH side only). (2) Repeat the total preload measurement. (4) Repeat the differential ring gear and differential drive pinion tooth contact pattern inspection. 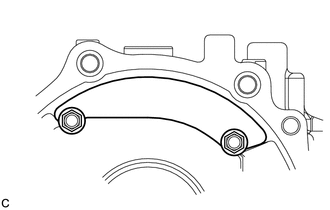 (a) Remove the 10 bolts and differential side bearing retainer. (a) Install a new rear differential drive pinion bearing spacer to the differential drive pinion. Face the smaller inside diameter towards the front of the vehicle. (a) Install the rear differential drive pinion oil slinger to the differential drive pinion. (a) Install the differential drive pinion to the rear differential carrier. 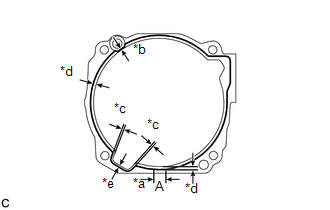 (b) Install the differential side bearing retainer with the 10 bolts. 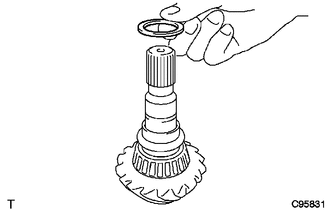 (a) Apply hypoid gear oil LSD to the threads of the rear drive pinion nut and its seating surface. 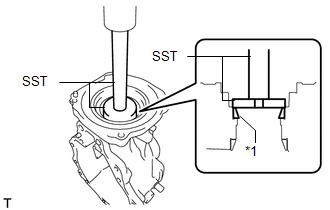 (b) Using SST, temporarily install the rear drive pinion nut to the differential drive pinion. 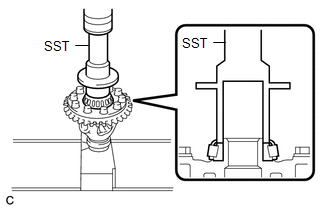 (c) Using SST and a torque wrench, inspect the differential drive pinion preload (starting torque). For a more accurate measurement, rotate the bearing forward and backward before adjustment. 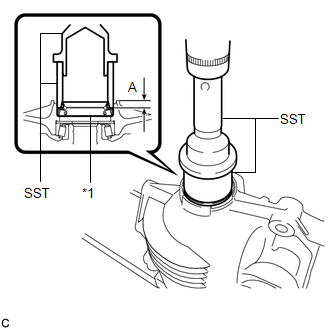 (d) If the preload is insufficient, use SST to tighten the rear drive pinion nut 5° to 10° at a time. Measure the drive pinion preload and repeat the adjustment as necessary until the preload matches the specified torque. 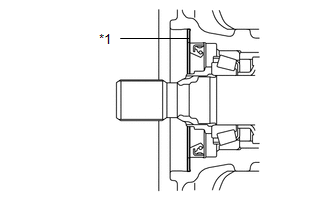 (e) If the tightening torque of the rear drive pinion nut exceeds the specified torque but the preload is still insufficient, remove the rear drive pinion nut. Then check if the rear drive pinion nut and differential drive pinion screw threads are damaged. (f) If no damage is found, replace the rear differential drive pinion bearing spacer, apply hypoid gear oil LSD to rear drive pinion nut threads and repeat the procedure above. 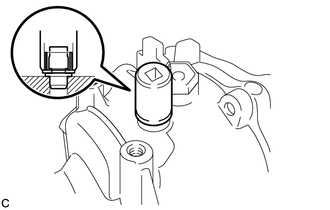 (a) Install the rear differential breather plug oil deflector with the 2 bolts. 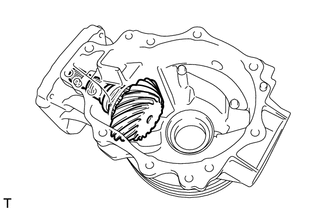 (a) Install the rear differential case assembly to the rear differential carrier. 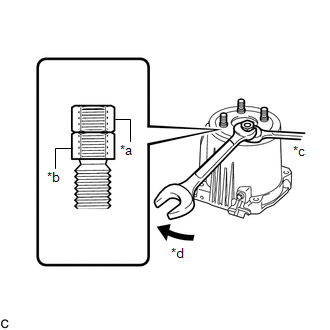 (a) Install the differential side bearing retainer to the rear differential carrier with the 10 bolts. (b) Using a non-residue solvent, remove grease and oil from the contact surfaces of the rear differential carrier and differential side bearing retainer. 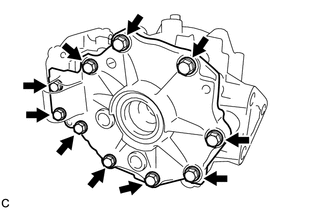 (c) Apply seal packing to the areas indicated in the illustration of the rear differential carrier. Install the differential side bearing retainer within 10 minutes after applying seal packing. If the differential side bearing retainer is not installed within 10 minutes after applying seal packing, completely remove and then reapply seal packing. 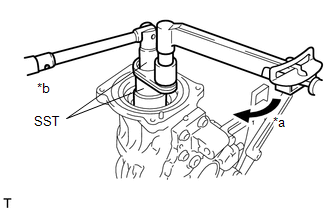 (d) Install the differential side bearing retainer to the rear differential carrier with the 10 bolts. After installing the differential side bearing retainer, do not add oil or drive the vehicle for at least 1 hour. In addition, avoid sudden acceleration and deceleration for a minimum of 12 hours. 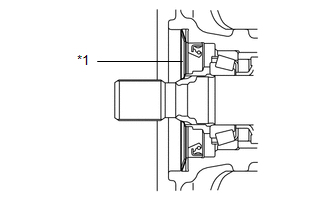 (a) Using a chisel and a hammer, stake the rear drive pinion nut as shown in the illustration. 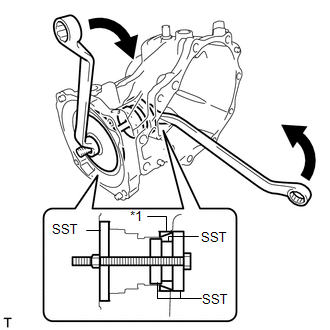 (a) Using SST and a press, install a new diaphragm oil seal into the rear differential carrier assembly. Install the diaphragm oil seal uniformly. Press fit the diaphragm oil seal straight. 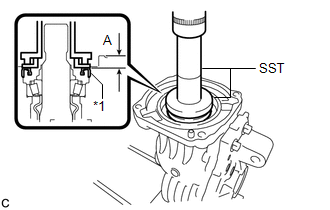 (a) Using SST and a press, install a new rear differential side gear shaft oil seal into the differential side bearing retainer. Install the rear differential side gear shaft oil seal uniformly. Press fit the rear differential side gear shaft oil seal straight. 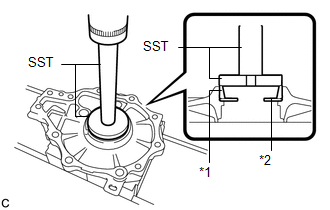 (a) Using SST and a press, install a new rear differential side gear shaft oil seal into the rear differential carrier. (a) Install the connector clamp bracket with the bolt. (b) Engage the claw to install the electro magnetic control coupling wire harness connector. (a) Align the matchmarks on the rear differential dust deflector and electro magnetic control coupling sub-assembly, and temporarily install the rear differential dust deflector. 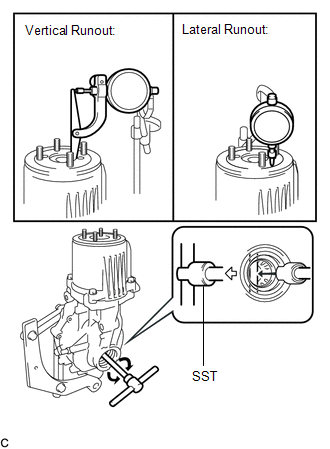 (b) Using SST and a press, install the rear differential dust deflector. If the end surface of the electro magnetic control coupling sub-assembly is damaged while installing the rear differential dust deflector, replace the electro magnetic control coupling sub-assembly with a new one. (a) Temporarily install 4 new stud bolts to the electro magnetic control coupling sub-assembly. 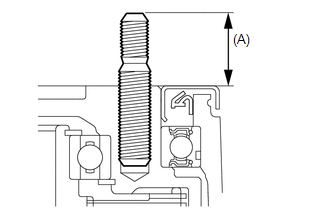 (b) Install 2 service nuts to the stud bolt. (c) Lock the upper nut using the lower nut. (d) Turn the upper nut and tighten the other 3 stud bolts to the electro magnetic control coupling sub-assembly in the same way. If the threads of the electro magnetic control coupling sub-assembly are damaged while installing the stud bolt, replace the electro magnetic control coupling sub-assembly with a new one. (a) Using a socket wrench, service nut and a hammer, install a new rear differential carrier cover breather plug to the rear differential carrier. Tap the rear differential carrier cover breather plug in until the flange meets the edge of the rear differential carrier. Use a service nut with an inner diameter of 13 mm (0.512 in.) and a socket wrench appropriate for the service nut. 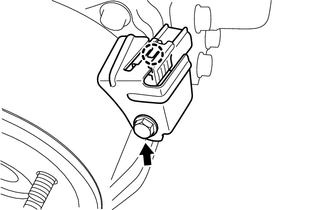 Tap in the rear differential carrier cover breather plug until it sits flush with the rear differential carrier. (a) Install a new gasket and the rear differential filler plug.